This presentation is based on four years of in-depth interviews with scientists, micro and molecular biologists, chemists, and geneticists from many countries. 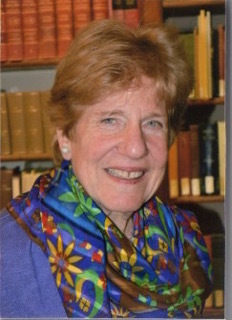 Judith M. Heimann, a New Yorker by birth, and a (Radcliffe) Harvard graduate in English literature, comes from a family of writers, mostly journalists. She has spent much of her life in Europe, Asia, and Africa as an American diplomat and diplomat's wife. Her diplomatic memoirs, Paying Calls in Shangri-La: scenes from a woman's life in American diplomacy (U. of Ohio Press, 2016), was nominated for the American Academy of Diplomacy's Douglas Dillon prize for the best book on the art of diplomacy. She will speak about what she learned in researching and writing her fourth book, her first entirely on a scientific subject: Using Nature’s Shuttle: The making of the first genetically modified plants and the people who did it (Wageningen Academic Publishers, NL, 2018).The book is based on four years of in-depth interviews she made of the (mostly young) scientists involved: two dozen micro- and molecular biologists, chemists, and geneticists from many countries working in labs in Belgian public universities. Heimann's scientist informants told her what it was like for them, while engaged in basic research. exploring the newly visible worlds of molecular and microbiology, to come upon an ancient strain of bacteria that was able to genetically modify plants; this led them to adapt its techniques to make desirable changes in a variety of plants. As in the book, she will sketch the jargon-free story of their discovery and the adaptations these young scientists developed from it, leading to what Nobel laureate and molecular biologist Sir Richard Roberts calls “probably the greatest advance in agricultural biotechnology since the invention of agriculture”.